The Nano CR will satisfy a broad range of needs from those of a large hospital facility or imaging center, to that of a stand-alone clinic or surgery center. 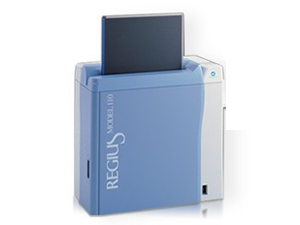 Whether it is networked with another Nano CR, an Xpress CR, or the REGIUS DR system, Nano CR delivers speed, workflow, and redundancy. Hybrid Processing… a patented Konica Minolta innovation that divides an image into multiple frequency bands ultimately producing a more natural looking image with less noise and artifacts. Two Resolutions… in addition to the standard resolution, Nano CR is capable of a high resolution of 87.5 µm which provides diagnostic quality images where recognition of subtle pathological changes is essential, such as special extremity and pediatric applications. Any Reader Any Time… images are always displayed on the control station where the plate is registered. This maximizes turnaround times. Nano CR… provides flexible configuration options. It’s capable of networking with additional units in order to meet your specific workflow needs, as well as provide optimal support for true redundancy. W29.1" x D14.4" x H29.4"